Barnett is one of the leading names in the industry and is proud to have sold over one million of its high performance crossbows. Dedicated to providing its customers with quality products that are also affordable, one of their most popular models is the Wildcat C5. It is designed with performance and comfort in mind, and is an excellent choice for beginners and experienced hunters. One of the most important aspects to consider on any crossbow is its build. This will affect its performance, along with how comfortable and easy it is to aim and draw. The build will also determine the weight of the crossbow, and it is important to look for one that can be comfortably held for long periods of time and be easy to carry. When the crossbow features a lightweight construction you will find it easier to hold without experiencing arm fatigue that can cause it to shake and throw off your aim. There are no problems with the build of the Wildcat C5, which is designed with performance and comfort in mind. The quad style limbs come with high energy wheels so you can enjoy a stable and powerful draw, with plenty of kinetic energy to take down small and large game. The string and cable system also make it easy to pull the 150 pound draw weight. Weighing only 8.5 pounds and built for efficiency and comfort, it is easy to see why the Barnett Wildcat C5 remains one of the most popular crossbows with hunters of all skill levels. 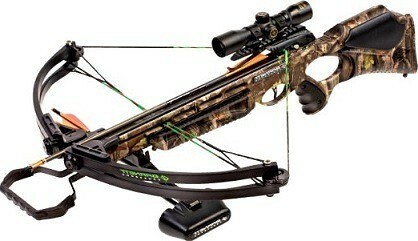 The design of a crossbow not only determines its appearance, but also how comfortable it is to use. This Barnett crossbow comes with a traditional camouflage pattern on the limbs and rear stock that make it easy to blend into your surroundings, which is always an advantage when you are trying to remain undetected in a hunting blind. The camouflage design also gives the bow a professional and stylish appearance that you will be proud to be seen holding. It is also designed with performance and comfort in mind, which is always appreciated whether you are a beginner or more experienced archer. The grip is padded for comfort and comes with a convenient thumb hole to encourage proper hand placement, which can prevent painful accidents while also improving your aim. The rear stock features a lightweight and sturdy GAM composite design that is comfortable for all types of archers to grasp and handle. With a well designed stock, comfortable grip, and smoothly pulling trigger this crossbow can improve your stance while ensuring precise and accurate hits. Barnett has remained a leading manufacturer of crossbows for over 50 years due to its high performance design, and the Wildcat C5 lives up to the company’s reputation. It is capable of providing you with all of the speed and power you need to penetrate most targets, including deer, antelope and small game animals. The trigger ensures a smooth release, and the cable system makes it easy for archers to pull the 150 pound draw weight. The limbs and high energy wheels ensure plenty of stability and power behind each shot, with a maximum velocity up to 320 feet per second. The bow can generate 91 FP of kinetic energy, which is more than enough to effectively penetrate moving and stationary targets. While the Wildcat 5 is a top performing crossbow, it should be mentioned that if does not come with a dampening system which might make it too loud to be effectively used in some situations. There are plenty of included features which ensures this bow’s continued popularity. Everything you need to start practicing your archery skills is included with this convenient kit. To make the 150 pound draw weight easier for some archers to pull the stock features a convenient attachment that is designed to hold a crank styled cocking device. While the crank is not included, having the option to add one if necessary is always appreciated. The crossbow comes with a five year warranty that provides you with additional peace of mind, along with a helpful instructional manual. The bow can be easily assembled in minutes, and the necessary tools are included. The sturdy 4 x 32 scope is easy to adjust, and is accurate up to 20 feet right out of the box. For added convenience the kit also includes a quiver, along with three 20 inch arrows so you can immediately start using the crossbow. It is easy to see why Barnett crossbows have remained popular with consumers for over 50 years, especially after you have fired this model. Featuring the lightweight build and high performance design that Barnett is famous for, there really isn’t much not to like about this crossbow. It is capable of producing plenty of speed and power to make accurate killing shots, and with the ability to attach a cocking device this crossbow can grow with your skill level. Everything you need to start hunting is included, all at an extremely affordable price. It features a fast speed and powerful performance that can easily take down most North American game. You will appreciate its lightweight and sturdy construction that makes this crossbow ideal for archers of all skill levels. The Wildcat C5 comes at an affordable price that will fit almost any budget. It should be noted that if you want this crossbow to be silent when fired, it will be necessary to add a dampening device.